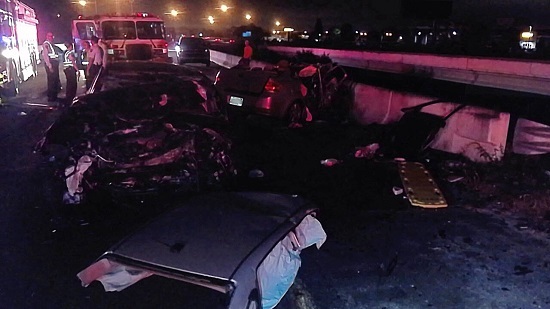 Alcohol was not a factor in the I-75 crash, the Florida Highway Patrol said. HILLSBOROUGH COUNTY – Three people died Thursday (Nov. 23) night from injuries received in a head-on, wrong-way crash on I-75, according to the Florida Highway Patrol. Justin B. Lakin, 21, of Bradenton; Lashay D. Waiters, 24, also of Bradenton: and Yvette R. Alexandre, 21, of Ruskin, died at Tampa General Hospital where they were taken after the crash. The crash happened about 10:02 p.m. on southbound I-75 south of Gibsonton Drive. Troopers said Mr. Lakin was driving a 2012 Toyota Corolla north in the center southbound lane of I-75. The Toyota struck a 2009 Ford Focus driven by Mr. Waiters head-on. Ms. Alexandre was a passenger in the Ford. It is unclear why and for how long Mr. Lakin started driving the wrong way, troopers said. Alcohol did not appear to be a factor in the crash. The crash closed southbound I-75 for several hours.